Watermelons are a summer favorite but sometimes gardeners find that these juicy melons can be a little tricky to grow. In particular, knowing how to water watermelon plants and when to water watermelons can leave a home gardener feeling a little perplexed. 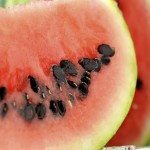 The advice is so varied and myths on watering watermelons abound, but with a little knowledge, you can water your watermelons and know that they are getting exactly what they need. Watermelons need water throughout the season, but a particularly important time when to water watermelons is while they are setting and growing fruit. The reason for this is that watermelon fruit is made up of 92 percent water. This means that the plant must take up an enormous amount of water while the fruit is developing. If this water is not available to the plant at this time, the fruit will not be able to grow to its full potential and may stunt the fruit or cause it to fall off the vine. It is also important to be watering watermelons while they are establishing in the garden or during times of drought. How to water watermelon isn’t complicated but should be done correctly. First, make sure that you are watering watermelons at ground level, rather than from above. Using drip irrigation rather than a sprinkler system will help prevent powdery mildew from developing on the leaves and will also stop dirt from splashing about, potentially spreading harmful disease. The second thing to be aware of when learning how to water watermelon plants is that you need to water deeply. Watermelon roots go deep searching for water to support the water hungry fruit. Water the plants so that the water goes down at least 6 inches into the soil. This may take at least a half hour, perhaps even more depending on the drip rate of your watering system. Watering watermelons does not need to be a scary or complicated process. Just take your time and provide water regularly and down low and you will have lovely and juicy watermelons in no time.